Christmas is but a distant memory and the new year festivities have ended, leaving us in the coldest month of the year. 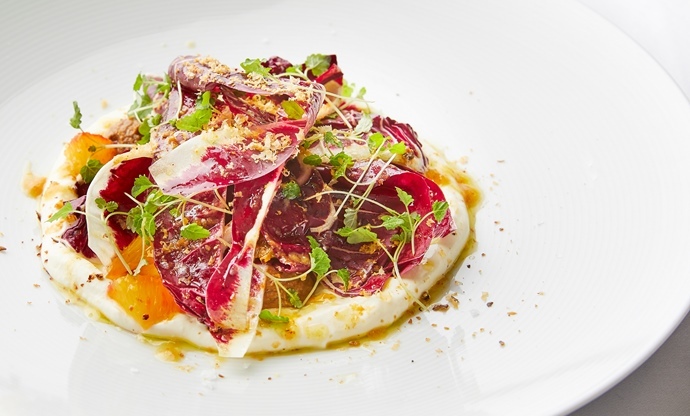 However, January adds a few exciting ingredients to the mix, including blood oranges, rhubarb and winter leaves like radicchio and castelfranco. Here's how to make the most of the month's produce. Supposedly the most depressing month of the year, January can be a long month of doom and gloom for many of us – full of frosty mornings and dark evenings. There is something to be said for embracing the opportunities presented by the climate though – we can enjoy the last month or so of true winter cooking, knowing that there’s light at the end of the tunnel and spring is within grasp. There’s still a bounty of root vegetables on the shelves, but January brings a few special treats of its own that are worth making the most of. Although they’re not native to these shores, a number of speciality oranges start to make their way over from the Mediterranean. Seville oranges are quite bitter and sour, but have lots of flavour – they’re fantastic in marinades and cocktails, but typically used here to make marmalade. Blood oranges are equally prized – they’re slightly on the tart side as well, but generally sweeter than Seville oranges. Both these varieties have short seasons so it pays to stock up and enjoy them while you have the chance. Just as seasonal but more UK-centric, January is the month to watch out for forced rhubarb. Regular rhubarb doesn’t appear for a few months yet, but up in the North West – in an area around Leeds, Wakefield and Bradford known as the ‘Rhubarb Triangle’ – rhubarb is forced to grow under pots. The result is something special – these stalks are more tender and delicate than regular rhubarb, as well as being an appetising shade of pink. Check out our collection of rhubarb recipes for some ideas on how to make the most of this British speciality, and scroll on for more recipes that celebrate January in all its glory. There’s still lots of fantastic venison available in your local butcher – the tougher, cheaper cuts make superb stewing meat, but there’s nothing quite like a loin of venison to impress your dinner guests. 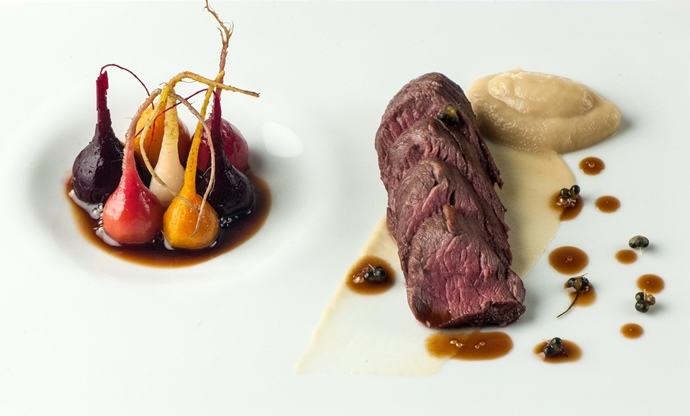 Simon Hulstone combines his with turnips and baby beetroots – both delicious at this time of year – and brings the dish together with a rich venison jus and a soy glaze. 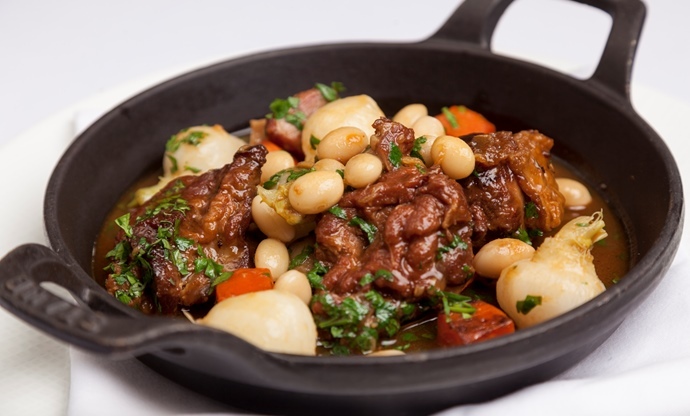 Richard Corrigan also makes good use of turnips with his lamb navarin – in fact, the name probably originates from the French word for turnip, navet. Richard sears his lamb, then uses the lamb fat to roast a base of garlic, anchovies and tomato paste, before braising the meat in white wine and lamb stock until meltingly tender. Two hours later, you’re left with a stew of incredible depth – finish with an array of herbs and serve. 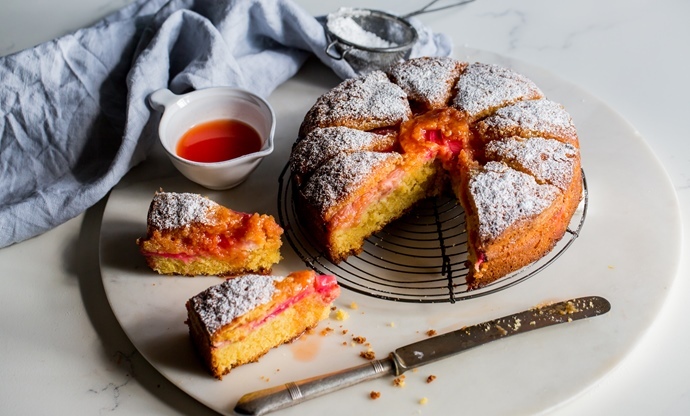 Louise Robinson’s drizzle cake is the perfect way to celebrate rhubarb season – the bright pink stalks make for a picture-perfect cake, and you could even combine them with blood oranges for a seasonal double whammy. Louise makes a moist sponge cake using buttermilk, semolina, egg and flour, then layers her rhubarb over the top, before baking the whole lot in the oven. Finish with a rhubarb and orange glaze – just simmered in a pan to make a syrup – and you have a lovely comforting afternoon treat. Blood oranges are delicious eaten fresh in salads and desserts, but Chantelle’s smart fermenting method opens the door to a whole new world of possibilities. She ferments the orange for a few days, before segmenting the flesh and making the skins into a quick jam, serving with a homemade ricotta, walnut butter and fresh, bitter radicchio leaves. 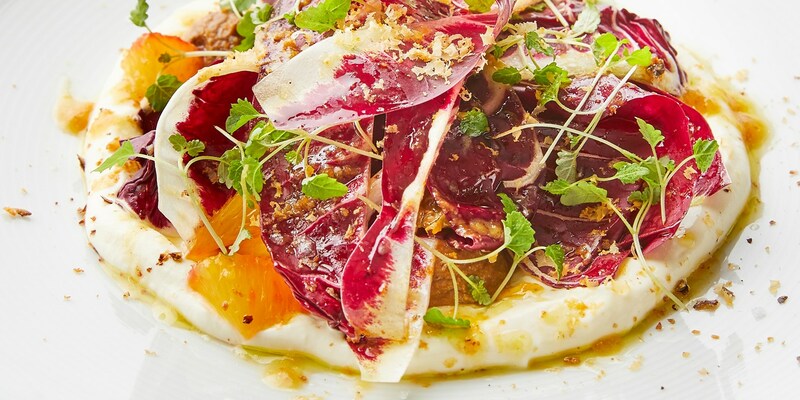 You can always buy the ricotta if you want to streamline the process, but the end result is the same – a beautiful, restaurant-quality dish. 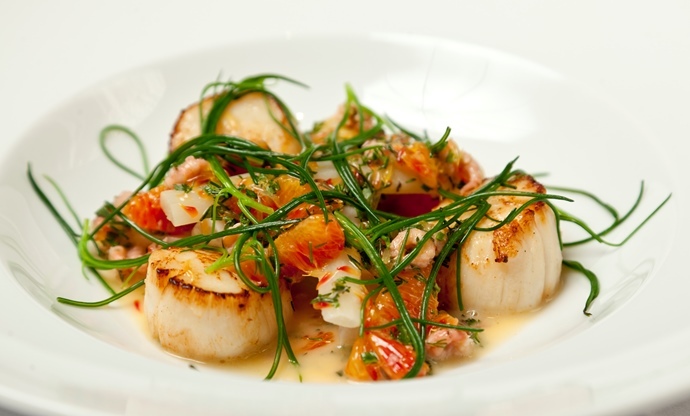 Another wonderful recipe from Richard Corrigan comes in slightly more delicate form, as he pairs meaty scallops with a stunning flavoured butter made from brown shrimp and sweet, sour blood oranges. The butter takes a lot of work but the final flavour is spectacular, working superbly with the seared scallops, sea herbs and salsify – another seasonal root vegetable. Give this a go as a dinner party starter. Marcus Wareing’s leek crumble is a quick, easy, delicious way to use up a big bundle of leeks – it makes a perfect accompaniment to a roast, or indeed, a fantastic meat-free midweek meal with a salad on the side. 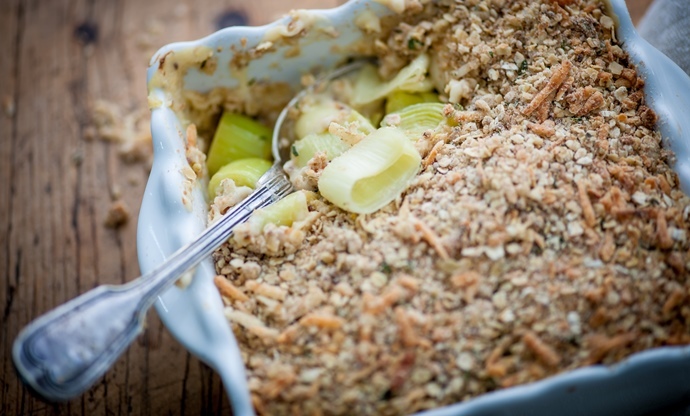 Marcus cooks his leeks gently in butter, then whips up a smoked cheese sauce to mix in with the filling, finishing the dish with a crumble topping of oats, flour, sesame seeds and thyme leaves. January is, generally speaking, not a plentiful time to be eating fish, but pollock is certainly worth keeping an eye out for – it’s a lovely alternative to varieties like haddock and cod, and it’s far more sustainable to boot. 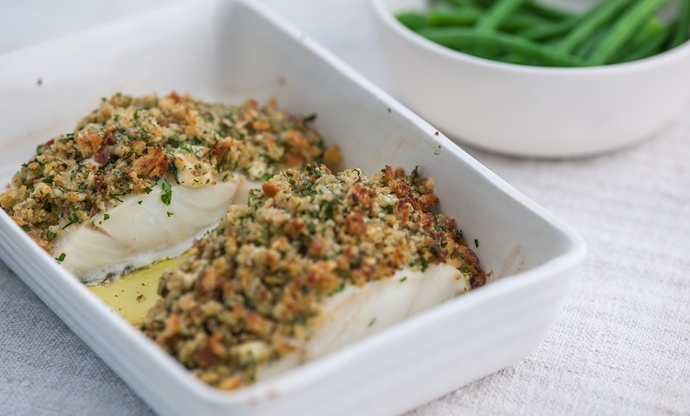 Nathan Outlaw’s simple, delicious baked pollock recipe can be on the table in just twenty minutes – simply season your fish, make your cheddar and herb crust to go over the top, and bake.